:((( But after 4-5 hours of persistent rewriting per day for 5 days in a row, something resembling an actual, scientific problem/question is starting to take form. But now it’s SATURDAY and I refuse to give that another second of my thoughts! Lazy breakfast in bed is easily my favorite part of the weekend, and lately Chia Pudding has been my favorite thing to eat in the morning. I love how it’s such a quick and effortless breakfast! It takes me literary 5 min to prepare in the evening, and another 5 in the morning to add some fruit/berries/granola/seeds etc. I must admit, at first I was very skeptical towards chia pudding. Probably because I only used water and a little sweetener. It turned out too thick, all lumpy and tasted like slime. But with a little coconut milk or plant milk, vanilla, pinch of salt and perhaps cinnamon/cardamom or berries, I find it heavenly! It is also very easily digested and hence perfect for a sensitive IBS-person like myself. Note: If you’re feeling adventurous, you could of course use only coconut milk and no water, for an extra decadent pudding! Prepare the pudding either the night before, or at least 20 min before serving. Mash strawberries in a cup, bowl or glass jar. Add the rest of the ingredients and stir thoroughly. Leave to thicken over night in the fridge, or for 20 min if you forget to prepare the night before : ) Give it another stir to loosen up all lumps before adding topping. 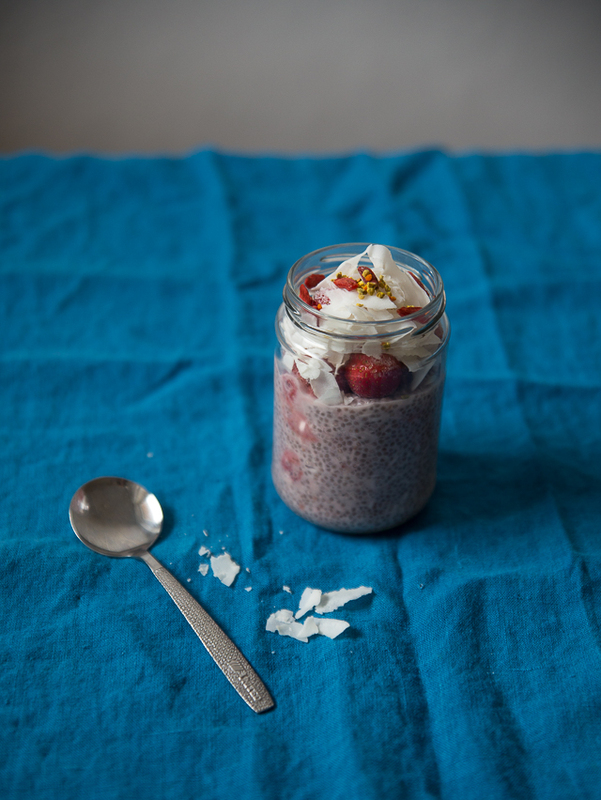 Top with berries, fruit, coconut shavings, granola, nuts, seeds or whatever you prefer! I topped mine with strawbs, coconut shavings, goji berries and a lovely local bee pollen I found at the Farmer’s Market last weekend. I might snap a pic and share on Instagram. I know all about thesis crisis! It’s the worst. I’m writing my Master thesis at the moment and I’ve had some trouble with the subject in the beginning, too. But now it’s finally beginning to take form. 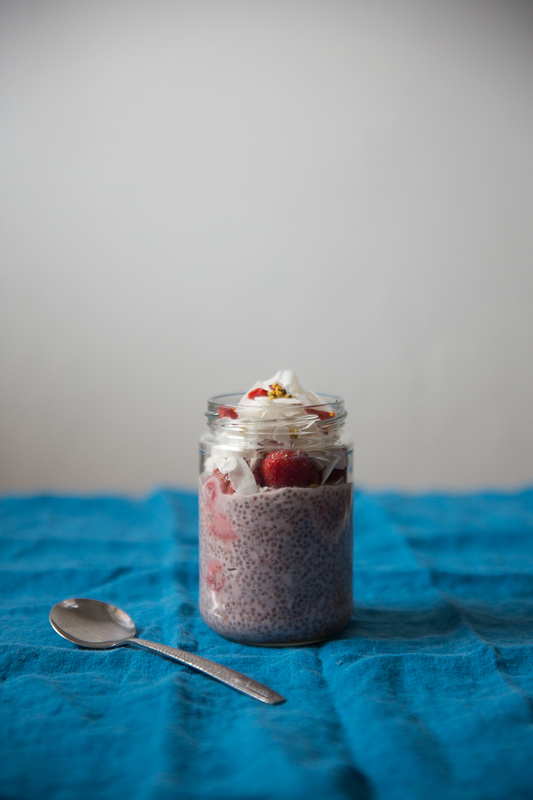 Best feeling :) This chia pudding looks really delicious. I make them all the time but I haven’t tried strawberry yet. Thanks :) Yeah the beginning is the hardest I think. But it will be rewarding in the end to have spent so much time writing a good problem formulation! Tack för tipset om redigering! Gillar camera raw för att det i princip bara är reglage som man kan dra i och direkt ser hur det påverkar bilden. Det känns som att man måste kunna photoshop för att veta vad alla olika funktioner gör med bilden där. Och det känns lite som att lightroom är enklare eftersom det också består av många reglage ;) Använder du några presets eller kör du allt själv?